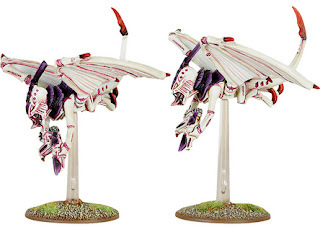 The 4th Generation/Edition refresh of the Tyranid codex caught me completely by surprise. Moloch, who at that time was pretty tight with the studio, had warned me it was coming. I remember being shocked, thinking that Nid players had waited so long for their codex after the release of 3rd Edition (not, actually, that long now that I look at it objectively), and that there was no possible way that we could be getting new models because Games Workshop had only just refreshed the entire model line. 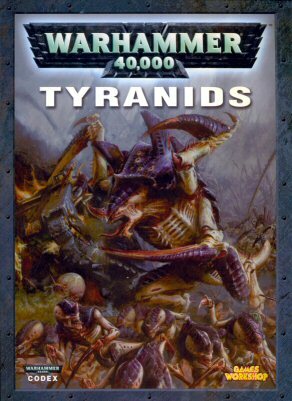 Long story short, I was, more or less, happy with the situation the Tyranids were in during 3rd Edition, and I couldn't imagine how Games Workshop could possibly improve on it. 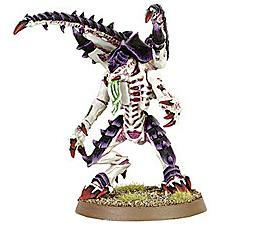 The 4th Generation Tyranid release was the one that brought the model line, more or less, to the condition we see it in today. 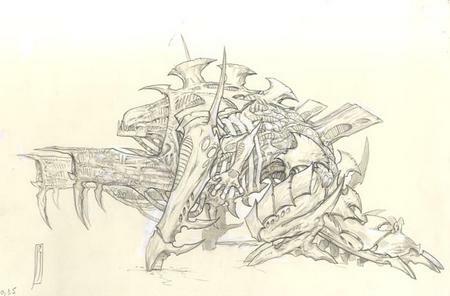 Where the 3rd Generation of models had introduced the beginnings of a unified Tyranid aesthetic (with more or less standardized head and back carapaces, limb construction), as well as the idea of painting the entire army in the same colour scheme, 4th Generation went even further down the path of Tyranid aesthetic unification. 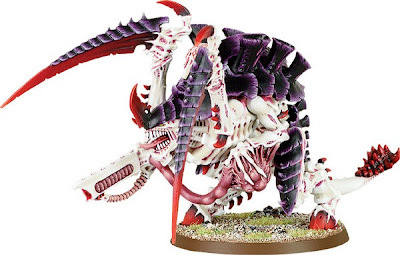 Whether it was inspired by working with the talented concept artist Roberto Cirillo or driven by Jes having completed the long-teased-about plastic carnifex, the majority of the Tyranid model line (which had just been completely resculpted not 4 years previous) was resculpted for this release. 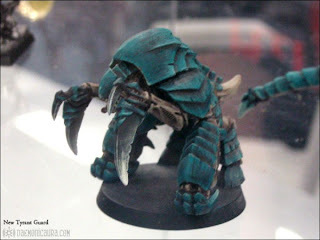 From the vantage point of 3rd Edition, that seemed like madness, but looking back upon it now, it's clear that some of the motivation fo the 4th Edition Tyranid refresh must have been getting rid of some of those rough, 3rd Generation sculpts. I think one of the most beautiful, possibly somewhat underloved, model to come out of the 4th Generation release was the pewter Hive Tyrant. It was new, it was gorgeous, and it harkened back to the design of the 2nd Generation Hive Tyrant while keeping in line with unified Tyranid Aesthetic. Gorgeous! 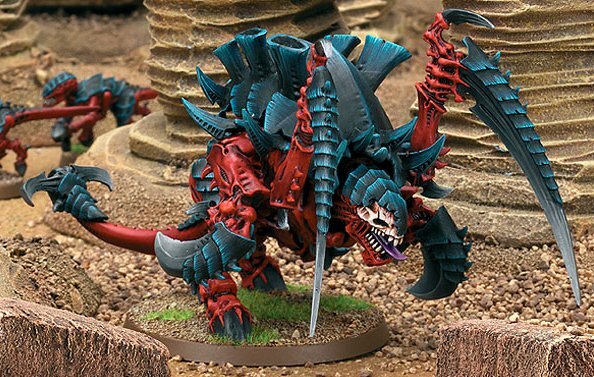 I think the only reason I never bought one was because I was distracted by the plastic Carnifex...good thing, too, as this gorgeous model has now been rendered into plastic! METAL HIVE TYRANT: THE TRIUMPHANT RETURN OF BONESWORDS AND LASHWHIPS! METAL LICTOR THE FIRST: GRIBBLY, SLASHY AWESOME. 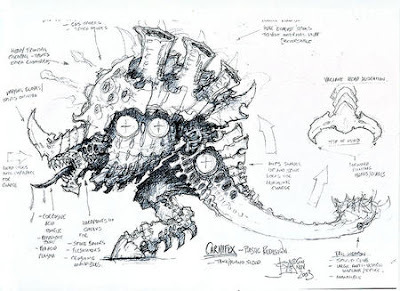 ...untfortunately, as I tried to demonstrate with my Exocrine, those concepts are better accomplished using a larger canvas, and the much smaller Biovore just wound up looking somewhat constipated as someone tried to squeeze all those good ideas onto a much too small model. METAL BIOVORE. NNNNNGGHH! NNNNNNGGGHH! I'M GOING TO CLEAR THIS OBSTRUCTION ONE DAY. The Raveners were brought more in line with the plastic Warrior models. The thicker talons were a nice touch to make them look more tunnel-y, and I like the tail, but the models never impressed me enough to make me want to shell out for them. What's more, the 4th Generation Codex gave us the ability for Raveners to carry a ranged weapon without having to give up one of their arm slots (which, let's face it, are better suited for combat weapons). It was called a "Thorax weapon", and it was somehow mounted in their chests, but the models didn't come with any options for it. METAL RAVENERS. NICER MODELS; PITTY 'BOUT THE THORAX WEAPONS. 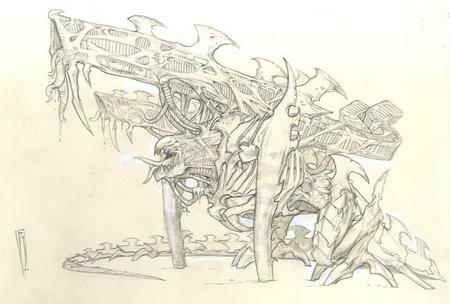 ...but I was always in love with Warren's sketches (like, to a thinking-of-proposing-marriage level), and, after a comment from Moloch or Hydra, I could never see the 4th Generation Tyrant Guard as anything more than the attendant, heavily-armoured doggies of the Hive Tyrant. There's even a comedic image in my head of them bounding into the air to catch bullets as they are so obviously too short to be of much use as a shield wall for a Hive Tyrant. METAL TYRANT GUARD. NICE SCHEME; SHAME ABOUT HIS DIMINUTIVE STATURE. METAL BROODLORD. DON'T CRY FOR ME, ARGENTINA!! 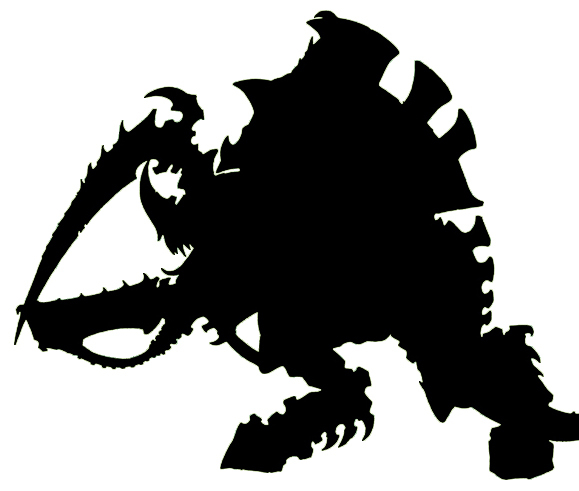 A little after the 4th Generation codex was released, the Fall of Medusa V global campaign book added a second Tyranid independent character: Deathleaper. The creature was based on a creation of Canadian Games Workshop staff (you're welcome, world), back when there still was a Canadian office, for their Canada-only Rise of the Swarm campaign. Deathleaper was just like any other Lictor, except meaner, and when I look to the 5th Generation codex's rules for the creature, I can't help thinking that his rules play like every Lictor should. METAL DEATHLEAPER. PLAYING HOW A LICTOR SHOULD SINCE 2006. 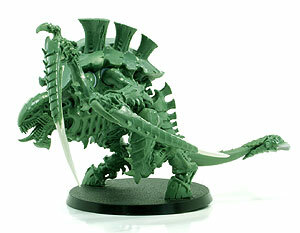 In fact, the only models to survive the 4th Generation purge were the Jes Goodwin plastics (Gaunts and Warriors, which was fine because those models aged magnificently), the Biovore (which, as already noted, was on its last legs and destined for resculpting), and the rather-sad, rather-annoying-as-ever metal Gargoyles. When checking the 4th Generation codex's colour section, you can see that they didn't even bother to repaint the 3rd Generation Gargoyles in the spot where they are featured (though GW did go to the trouble of painting 8 of them--the minimum number--up in the Leviathan scheme for the shot demonstrating Force Organization Charts). 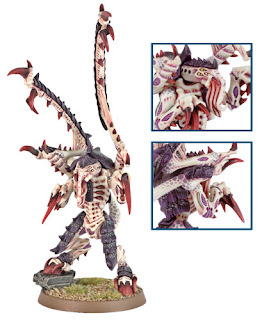 Now that we've got those out of the way, we can move onto the important modeling events that took place with the release of the 4th Generation Tyranid models. The first momentous modeling event of the 4th Generation was Jes Goodwin's rescuplt of that most ancient of Tyranid models: the plastic Genestealer. A conservative estimate puts this little guy's age at 10 years, but, as I'm not versed on the Space Hulk release dates, it's likely that the plastic Genestealer was even older. A simplified, snap-together version of the new plastic Genestealers released early, alongside some plastic termagants, in the "Battle for Macragge" starter set. BATTLE FOR MACRAGGE. 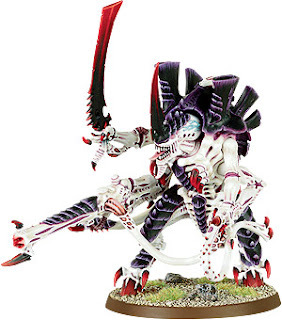 THE FIRST TIME NIDS FEATURED IN A TRADITIONAL 40K STARTER SET. 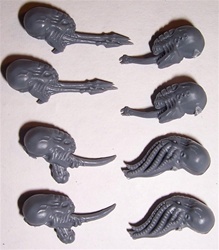 SNAP TOGETHER PLASTIC GENESTEALERS, INCLUDED IN THE BfM SET. Though they were lovely and welcome and all us Nid players could have hoped for, their release was a bit of a dubious one as it may have been the first instance of the internet and advance rumours/photos hurting a Games Workshop release. 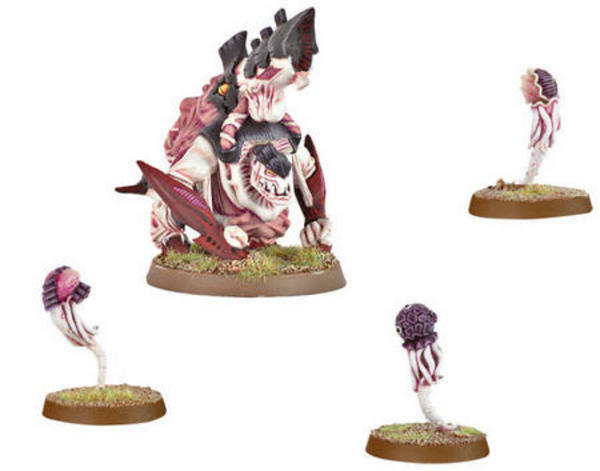 Someone got a hold of advance photos of the plastic Genestealers from the front, and the unflattering angle made it look like they had HUGE nostrils, and the trolls on the Internet had a field day at how hideous the models were...long before anyone had the opportunity to actually SEE the models. I'm not sure if it was at an event or as an aside, but Jes once said how excited he'd been about the plastic 'stealers, and then how disappointed he'd been when a couple of poorly-shot photos of the models we used as evidence against the, long before they were even released. 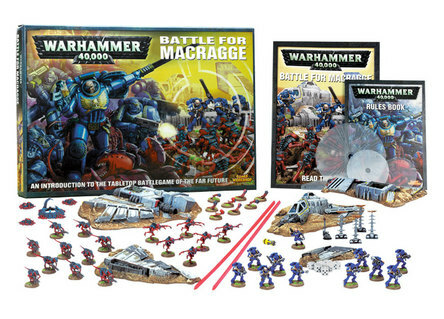 Not only did we get the early Battle for Macragge 'stealers, but when the 4th Generation Tyranid codex released, it dropped with a new Genestealer box, and that box gave us all manner of head options for the 'stealers, as well as Scything Talon arms and extended carapace plate upgrades. Heck, they even threw in some Tyranid scenery from the BfM boxed set on the Genestealer sprue. ...and you'd think that, after such a long wait, and with all those options on the sprue (FEEDER TENTACLES!!!) 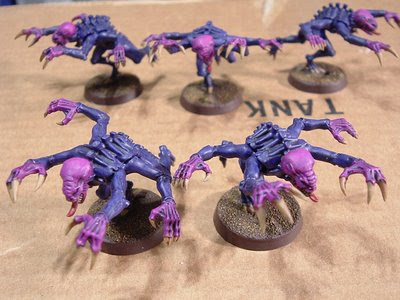 that the plastic Genestealers would be the biggest news of the 4th Generation refresh. But then there was another plastic model released with with the 4th Edition codex, one with a wealth of options on the sprue that dwarfed those on the Genestealer sprue. Where the 'stealer sprue had something like 16 heads to choose from for 8 models, this other model included 6 different head options for just the one model. 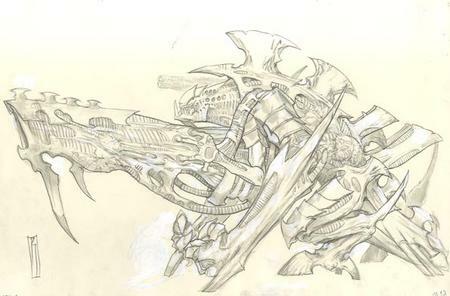 There were gun options and combat options and different carapace plates and different tail weapons. I'm talking, of course, about the plastic Carnifex. God. Would you look at that? A thing of beauty! Have you ever wanted to make love to a model so much in your life? 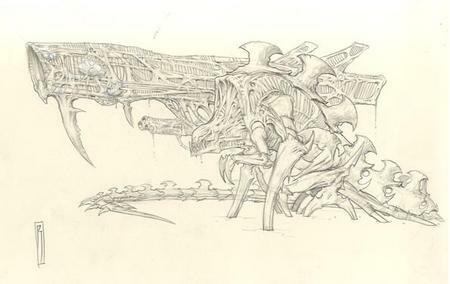 In all honesty, I feel that Jes Goodwin deserves about eighteen awards for having seen the plastic Carnifex through to the final product. No matter how many Tyranid biotitans get pressed into plastic--no matter how big they try to go--I believe that there will never be another Tyranid model with at once as much beauty and as much conversion potential as the plastic Carnifex. 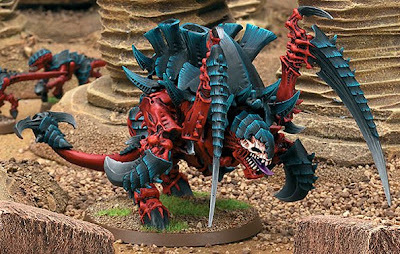 When photos of the plastic Tyrant and Tervigon leaked a couple of weeks back, they were impressive, but they weren't the plastic Carnifex. When it came time to write this part of the 4th Generation blurb, I couldn't shake the feeling that the plastic Carnifex, pretty much, could justify it's own Tyranid Archive entry. 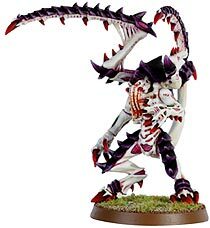 This model came with so very many options in one box, and yet in the hands of most Tyranid players, it was just the jumping off point for all manner of conversions. I have seen the plastic carnifex converted more times than any other Tyranid model. I don't actually know how many plastic carnifex boxes I have bought over the years, but I do know that I have never assembled a single one of them in the way that they were intended to be put together. And that shouldn't be taken as some slight against the standard model; that should be interpreted as a solid endorsement for just what a workhorse this model is. Anyway. Enough rambling. Suffice to say that I have nothing but good things to say about the plastic Carnifex, and one day I'm going to dedicate a whole post to fantastic plastic Carnifex conversions. If you've got some you think people should see, please link to them in the comments. 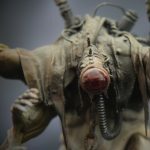 I dropped out of the 40k loop just prior to this period, so its great to see a thorough breakdown of this 'nid release. Apart from a 1996 retool for Space Hulk 2nd ed that made some *very* minor changes to the models, the plastic Genestealer was in circulation since 1989 (SH 1st ed). Does that make it the longest serving GW plastic kit ever I wonder? I think that that it had a longer shelf life than the original Rhino (which was '87 to 2000 I think. Dont quote me). The Termagants from the Macragge box always looked a little large to me. Are they bigger than the standard plastics? Man, I had no idea that there was another lictor pose in pewter. 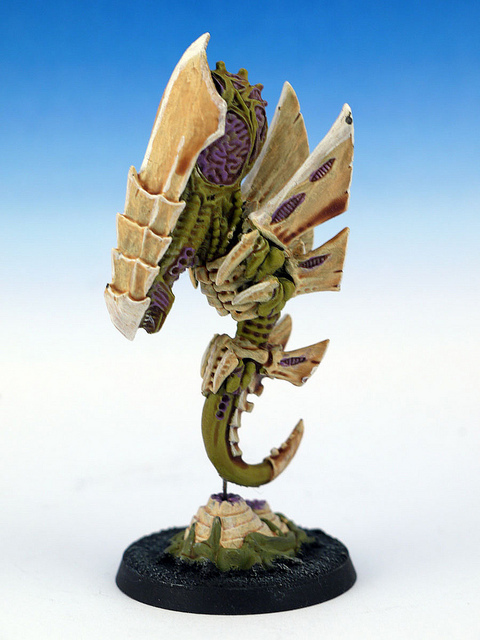 The lictor is the most iconic tyranid creature to me. I may have to pick that one up if I can find it on eBay. I agree with you regarding the Carnifex. I have three devourer armed carnifex, three screamer killers, and one with the FW crushing claws. I love them.